“YNX Goes 2 The Elephants” (Give It 2 Get It #17) – Yannix(Thailand)Co.,Ltd. The Thai Elephant (Chang in Thai) is the National Animal of Thailand. For centuries, the elephant has been a sacred and iconic presence in Thai culture. As much as elephants are an important part of Thai culture, sometimes they fall on hard times and when they do, they need our help. 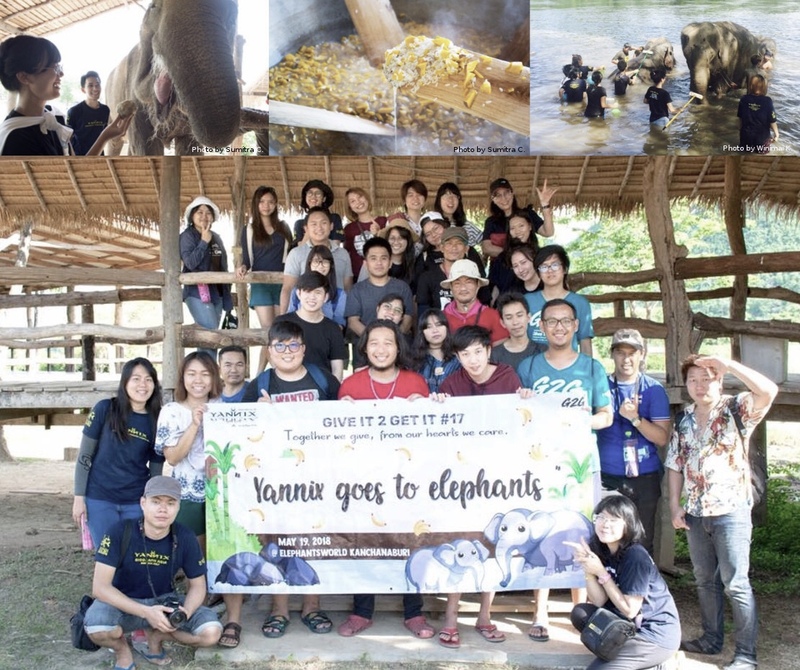 On Saturday, 19 May, Yannix Volunteers visited Elephants World, the elephant conservation center. Elephants World was founded in 2008 on the banks of the River Kwai by veterinarian Dr. Samart Prasitthipol and his wife. Initially, the center was established to care for a small number of elderly and injured elephants in urgent need. Over the last decade, the center has become a sanctuary for elder elephants, homeless elephants, elephants with health problems, and elephants whose owners could no longer care for them. Elephants World’s goal is to bring the old elephants back to do something useful to the community. In the morning, Yannix Volunteers were greeted by their hosts for the day, Mr. Navin and Mr. Jimmy. The mission for the day: to feed and bathe the elephants. The Volunteers were especially eager to catch a glimpse of the newest member of the Elephant World family, Baby Norgael, who was born on 10 May 2018. But before that could happen, there was work to be done. Mr. Navin showed the group how and what to feed the elephants. The younger elephants were fed bananas and watermelon. For the older elephants who have difficulty chewing and digesting their food, the volunteers were led to the kitchen where they were shown how to prepare a mix of soft nutrients rolled into sticky rice balls. After lunch came the moment everyone had been waiting for as Mr. Navin introduced the Yannix Volunteers to Baby Norgael who on that day was only 9 days old. After meeting the baby, the volunteers cleaned fruit and prepared fruit baskets. Then the volunteers joined the elephants by the river for bath time. The elephants were scrubbed clean. It was like a giant mud spa. There are 29 elephants (including Baby Norgael) currently residing at Elephants World, and that number is expected to increase well into the future as more and more elephants become displaced or ill.
On Saturday, 19 May, Yannix, through the Give It 2 Get It Program, tried to make a difference in the lives of these elephants even if only for a day.